So today I’m doing something a little different and something we don’t typically do. If you look through our list of reviews, you’ll see there are not really any duplicates but today I’m making an exception to that rule. 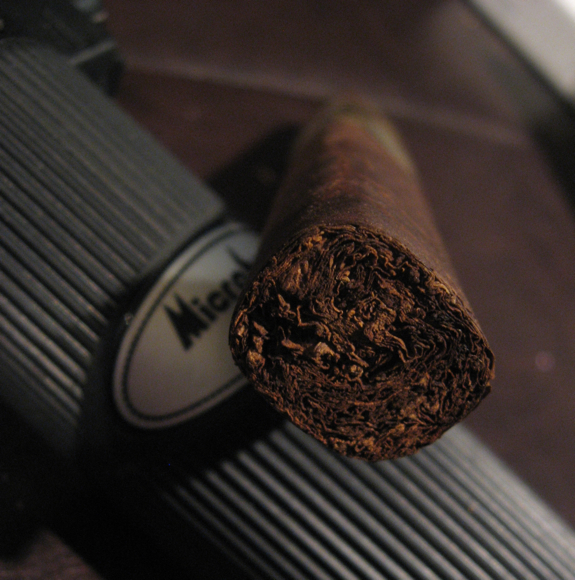 Previously we may have reviewed different vitolas of the same cigar, usually when it’s a newer vitola in the line. The cigar I chose today is neither a new vitola or a new blend or a new anything, it’s the exact same one that Tony reviewed. 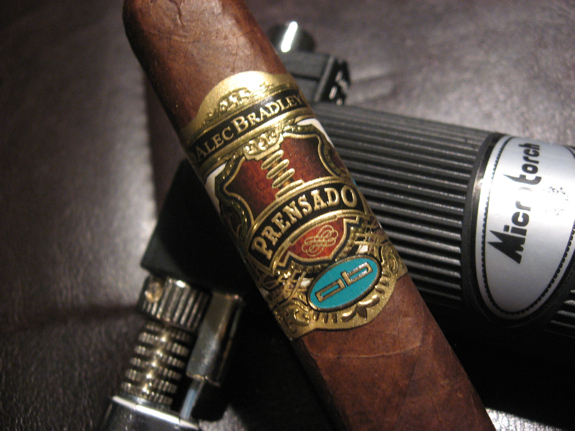 You can see Tony’s older review of the Alec Bradley Presado by clicking this link. 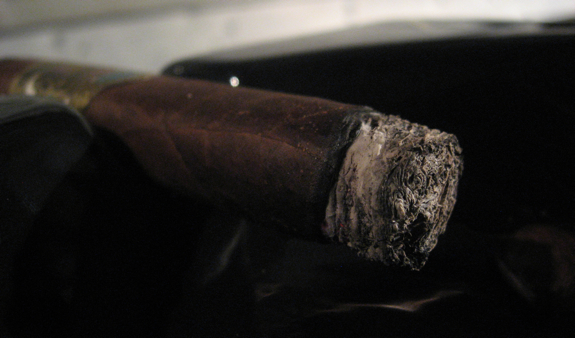 Ok, I gotta honestly say that I enjoyed this cigar. I went in with some bias as you can tell from my intro but it seems that once again you can’t judge a book by it’s cover (or it’s brand). 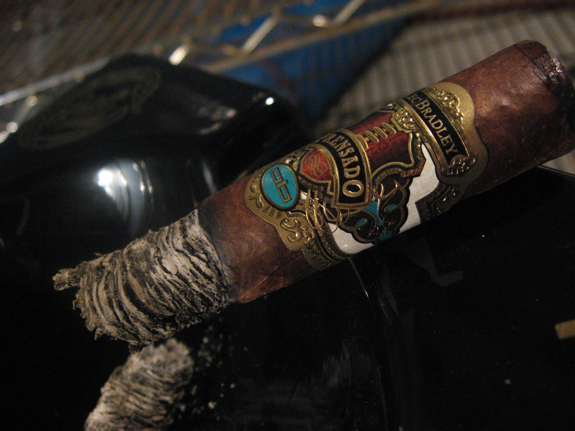 It started off with a nice burst of flavor and burned well through most of the cigar. The box-pressed shape was also very comfortable and a perfect size to smoke. The body was into the fuller range but the smoothness and balance made it blend in so nicely. 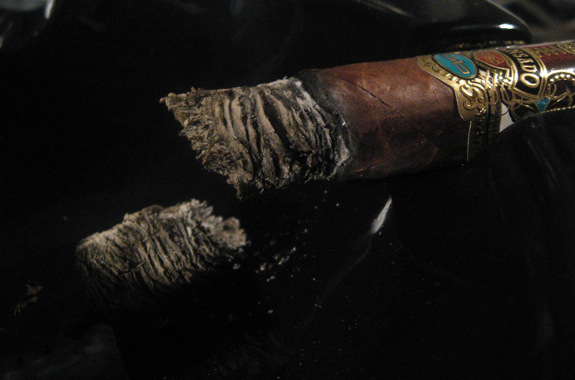 So I must avow that I found an Alec Bradley cigar I enjoyed from start to finish. Now the biggest downside to this cigar was the price. I didn’t look up the price until after I smoked it and I was a little shocked, especially since it’s one of the smaller vitolas in the line. This did not taste like a $9 cigar to me and that disappointed me because it was pretty good on all other accounts… I wouldn’t say this cigar makes me an Alec Bradley convert but it will open my eyes to at least try a few more blends from this brand. Today we have another new port that I stumbled across at the liquor store recently. It’s called Six Grapes and is considered to be a Reserve Tawny Port which was bottled in 2004. I was pleasantly met with a great mixture of in-you-face fruit mostly dominated by a strong blackberry tartness. The port also had a nice full bodied feel to it and coated the palate very smoothly leaving a nice sweetness on the tongue. The coating of your palate is one of my favorite aspects of pairing port and cigars because it’s like a fresh cleanse after each sip. 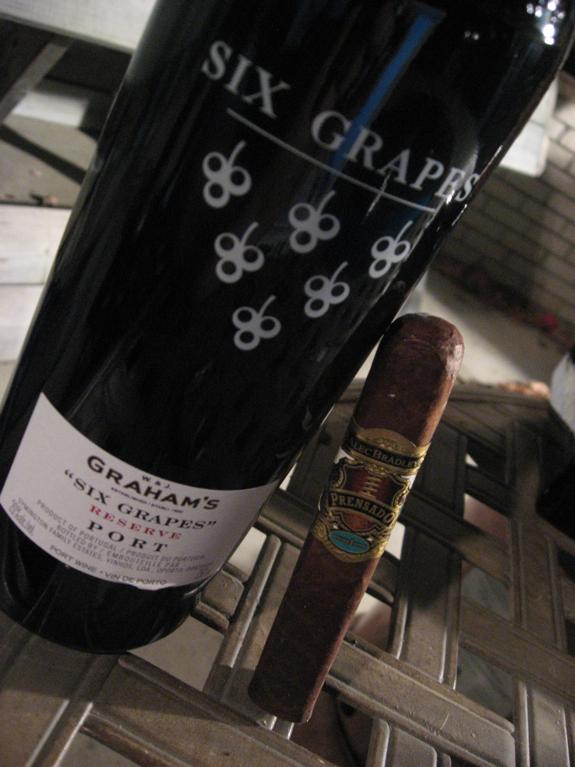 It paired excellently with the woodsy and spicy notes of the cigar. I would definitely recommend trying it out. 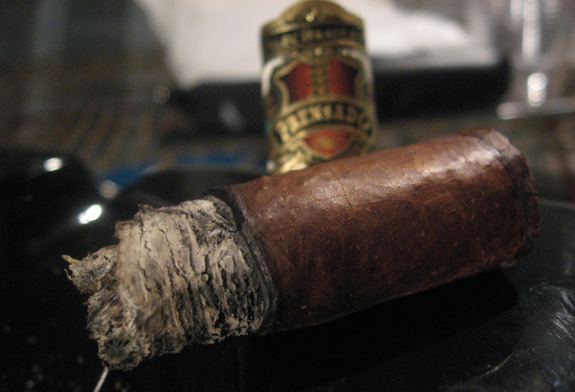 This cigar could also pair well with a nice strong coffee, scotch or maybe a dark soda. Nice review Daniel, I am with you I have not been really wowed by AB’s stuff… especially when you figure in the price. 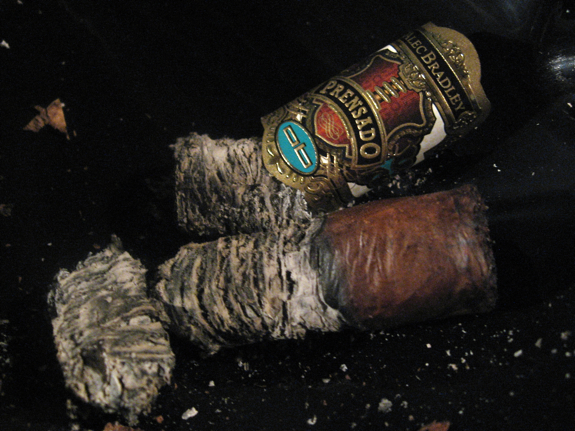 Just way to many better options at lower prices… I have had both the Prensado and the Tempus and both were enjoyable. However I do not seem to reach for them in the shop becuase of so many other options. Actually, the invite said “Cigar-b-que”. I can’t believe that Daniel T. made it, but I was so happy to see him since it had been a long time. A celeb at my first afternoon herf! 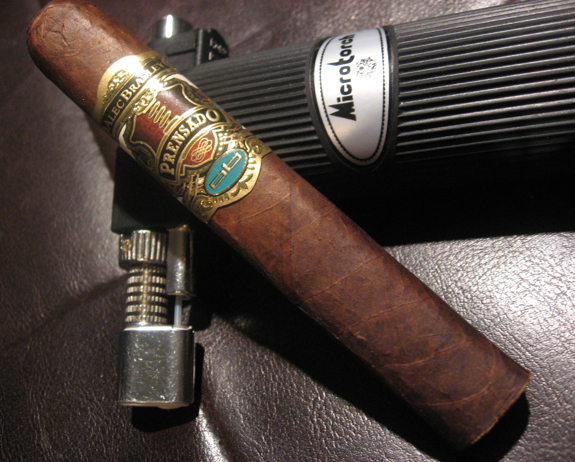 Yes, it is true – my buddy, Jarvis and I are big Alec Bradley fans. 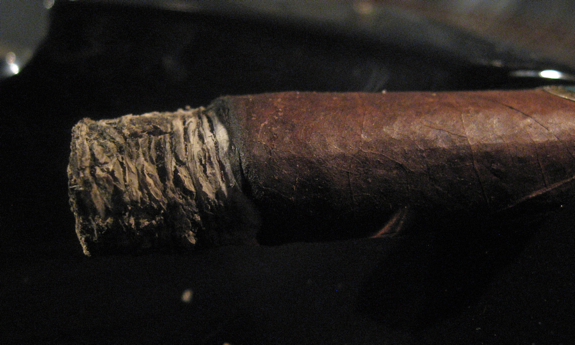 I don’t think I have ever had one I didn’t love: Trilogy – cameroon & exotic maduro, MAXX, SCR, Family Blends, etc……. I can go on. Interestingly enough, I’ve never had a Prensado – I guess it’s the price tag, huh?? It would have been nice if Daniel had brought one for everyone at the herf (just kidding!) but hey, Daniel was swamped with admirers from the moment he got to my place. I’ll tell you though what a gentleman Daniel is – he brought me a Cohiba (cuban) siglo 6. If that’s not a BOTL, then I don’t know what is. I showed him my humidor, which my wife had turned upside down for some reason (everything was mixed up). I wanted to give him a ciggy to show my gratitude, thinking maybe I have one he’s never tried…not possible. I gave him a Perdomo Lot 23 . Great review, Daniel. I can’t wait to try a Prensado… maybe Jarvis has a couple. It was great seeing you on Sunday. Hi everyone, my name is Jarvis…yes, the guy who convinced Daniel to try a Alex Bradley ( I am a MAXX freak ), I think the Tempus “Genesis” pairs well with a good 8 year or older Rum, but my favorite AB is the Family Blend “Robusto”, whille the Tempus does warm up a bit at the end, the Family blend is one cool Gar, start to finish, very complex, dare I say herbal, huge smoke and great tobacco flavour through out, great with a 15 year old Glenfiddich single malt scotch. Now that I have said my little bit, I must truly say Daniel is a top notch guy, who is as classy as the cigars he smokes. @Tadd – I’m the same way Tadd, too many options out there! Availability and how your local shop pushes these would likely affect your willingness to buy them too. @Lou – Cigar-B-Que! Classic! We need to patent that! haha. I had a great time Lou and will definitely make my way out there again. Lots of great people! So the port is good? I see that pop-up in my local liquor stores all the time but have been hesitant to pick any up. Glad you enjoyed it bro, I love the heck out of these sticks. Where do I get groupies like these guys?! Seems like an awesome bunch! Thanks for posting up the video Jarvis! Good times with great people! My favorite AB cigar, hands down. Tempus is right behind. Glad you enjoyed it. I’ll have to get my hands on some of these. Daniel, do you pair only tawny ports with cigars, or do you also do vintage ports? I have a Graham’s ’77 that’s been patiently waiting for the past ~30 years for the right occasion, but I wouldn’t want to overpower the wine. Jjo, I don’t pair ONLY with Tawny Port but it is my favorite pairing. I also enjoy craft beers and Scotch as my backup plan. Depending on the situation, I’m good with coffee or even a Diet Cola. I have a couple 20 years bottles but none that are 30+, that thing should be a very interesting drink! I’d love to hear about it once you crack it open!